The best and easiest almonds are sliced, I use them right out of the package as a topping for greek yogurt and fruit. But, Jewel doesn't always have them. And, I had a jar of slivered almonds that I wasn't eating because... they sort of were hurting my teeth? Or I imagined they were hurting my teeth? Idk, then I read somewhere about toasting almonds and toasted slivered almonds didn't hurt my teeth (if slivered almonds ever did hurt my teeth) and did taste a lot more, uh, toasty, and almondy. This was about when I stopped needing jam in my yogurt, I was actually going to the trouble of toasting my almonds for yogurt in a pan on the stove. Which is so not me! They're that good, though. Okay then, I read this article in Serious Eats about toasting nuts in the microwave, and hello it works! Though I had to adjust the times for my microwave. 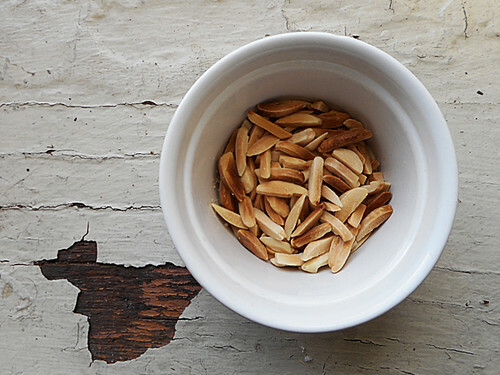 So easy, sometimes I make them even when there are sliced almonds on hand. Toss the almonds in a small dish and microwave on high for thirty seconds, stir, microwave for another thirty seconds, stir, microwave for another thirty seconds, stir, and depending on how impatient I feel, I call them done at this point or I do another thirty seconds and then I'm definitely done. YMMV, all microwaves are different, just know that once the almonds start to change color, a) it goes pretty quick and b) burnt almonds taste really terrible.